Opened in 1917 as the Princess Cinema, the cinema was renamed Le Parisien in 1963 and underwent a renovation in which its upper balcony was closed off. In 1974, the movie house was closed for renovations and gutted. It reopened in 1975 as a five-screen theater, and in 1989, it was split again into seven screens. In February 2002, the cinema was slightly damaged by a fire. One auditorium in the now seven-screen theater was completely destroyed, while six others suffered damage. The 2,184-seat cinema, which is owned by Famous Players reopened and continued to show French language films and lastly second run movies when it closed on 12th April 2007 . 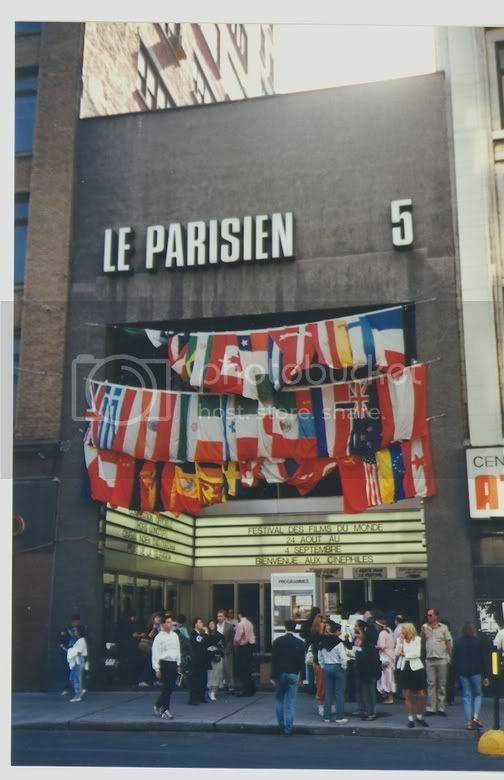 This photo, which I took in 1989 or so, shows Le Parisien when it had five screens. The MontrÃ©al World Film Festival was in progress at the time. It’s always sad to see an old haunt closed, but this one takes the memory of Harry Houdini with it. The Princess was where he performed in 1926 and took those infamous body blows from a McGill student that inflamed his (apparently already) ruptured appendix. He died soon after in Detroit. Downstairs is being converted, Cinemas 4-7 upstairs remains except for seats and projectors. The architect of the Princess Theatre was D.J. Spence. The artist in the photo CSWalczak linked to earlier is most likely F.S. 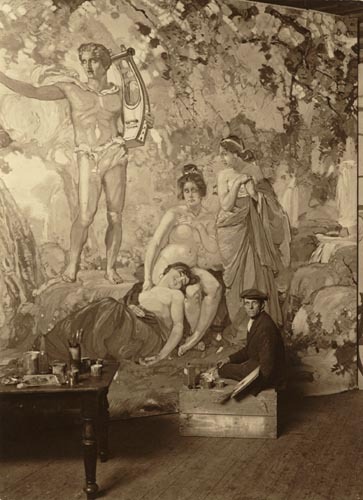 Challenor, who painted the mural on the theater’s sounding board. A brief article about the Princess Theatre appeared in the February, 1918, issue of the Canadian trade journal Construction. From the description above, it seems unlikely that any trace of the original decoration of the 1917 Princess remains. The 1917 house was itself a replacement for an earlier Princess Theatre. The photo to which mortonbg linked earlier must depict the front of the pre-1917 Princess, as the facade as designed by Spence was as tall as that of Le Parisien. I am utterly dismayed to read this place has closed. It had one of the coolest exterior lay-outs ever. There’s a photo in the photos section that shows the way the marquee recessed and all the flags hung around it. I always thought it was breathtaking. I only ever saw one film here (Tom Tykwer’s Heaven — part of the Montreal World Film Festival in 2002) but I really enjoyed it. The place showed French films on the regular, often without subtitles, so I never made it back. What a shame to read that it is closed and in decay. Maybe someone will rehabilitate someday.